 Relying on correspondence, diaries, and interviews, Miller (The House of Getty, not reviewed) presents vivid first-person perspectives from British, German, and American combatants in the Allied invasion of Normandy. The greatest movement of men and materiel in history, the invasion was a grand strategic achievement that signaled the end of Hitler's ambitions in the West and the beginning of the final campaign of WW II. However, the ordinary soldiers, whether British, American, or German, saw little of the strategy; for them, ``D-Day was nothing but fear, confusion, noise, muddle, chaos, hysteria and horror interspersed with flashes of heroism and humor.'' 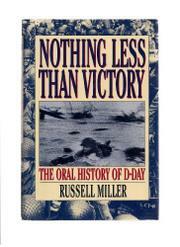 Miller gives the impressions of British women and children interacting for the first time with ``Yanks'' and, on the other side of the English Channel, the thoughts of French civilians on the German occupiers; he lets British commandos tell of their reconnaissance missions to the Normandy beaches; and he relates the intelligence battles between the Allies and Germans and the sometimes cordial, sometimes tense relationships between British and American officers planning the invasion. Soldiers reminisce about the boredom and fear felt during the long wait, the 24-hour postponement of the battle, and the tense Channel crossing. Most compelling of all, however, is the terrifying story of the storming of the beaches--especially the nightmarish Omaha and Utah beaches, where American soldiers took fearful losses from German artillery before wiping out the German fortifications--and the Allied battle inland. After the landings, Miller records Allied confusion, as British and American soldiers tried to consolidate their victory, and German despair as both officers and soldiers began to realize the war was lost. Riveting soldier's-eye views of the deadly confusion of battle, and a significant contribution to military and D-day literature.